Chicken Cacciatore and a Perfect Pasta Night Giveaway! Today was a beautiful Sunday day here on the East Coast, which inspired me to write about Italian food and this marvelous Chicken Cacciatore. Where I’m from (São Paulo, Brazil), Sundays are Italian food day. It’s the day the whole family – grandparents, uncles, aunts, cousins and etc – gather around the table to eat grandma’s delicious Italian food! Most people don’t know this, but São Paulo has the largest Italian community outside of Italy, with 10 million people with Italian ancestry (myself included!) just on that state and 25 million in the whole country. So, yeah…I do have a soft spot in my heart for everything Italian, especially food. But then again, who doesn’t love Italian food? 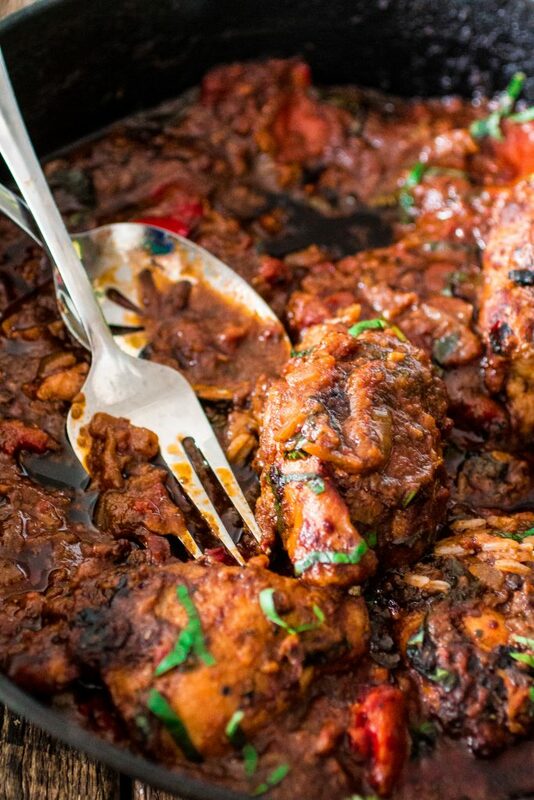 And if you love Italian food, you will definitely love this Chicken Cacciatore. It is hearty, flavorful and the chicken is oh so succulent, falling apart at the touch of a fork. Honestly, it’s one of the best chicken dishes I have cooked in my life. And I don’t say that lightly, since I have so many delicious chicken recipes on this very blog. Chicken Cacciatore, meaning chicken “hunter-style”, is a popular dish who originated on the Italian fields of Tuscany and Umbria. 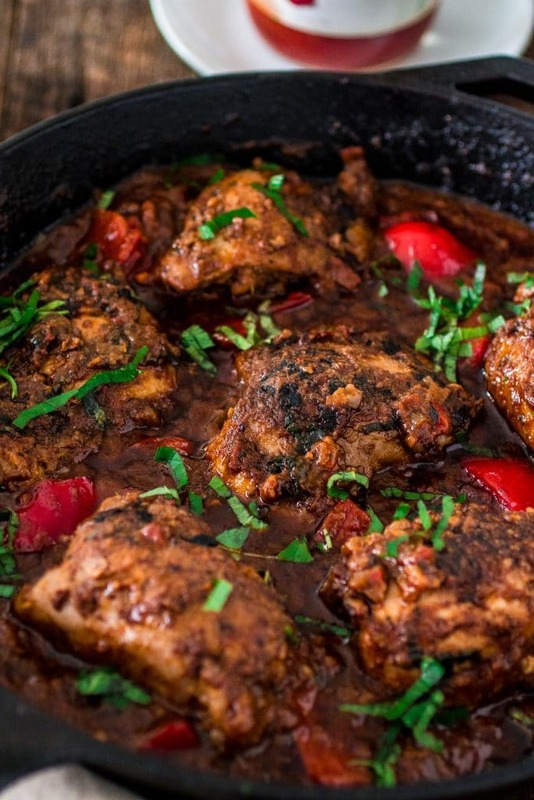 There are several variations of the dish, depending on the region, but the authentic recipe does not call for tomatoes or tomato sauce, using just the juices from the chicken and wine as the base for this stewed chicken. Some recipes also call for mushrooms and/or olives, which I chose to left out. As I value flavor more than authenticity, I added Marinara sauce to my chicken cacciatore as I like a heartier, thicker sauce. I gotta admit, I usually make my sauces from scratch by using canned tomatoes, mostly because I don’t like how the store stuff tastes. But I was drawn in to the practicality of using something out of a jar, so I gave Mezzetta’s marinara sauce a try and I am now forever hooked. 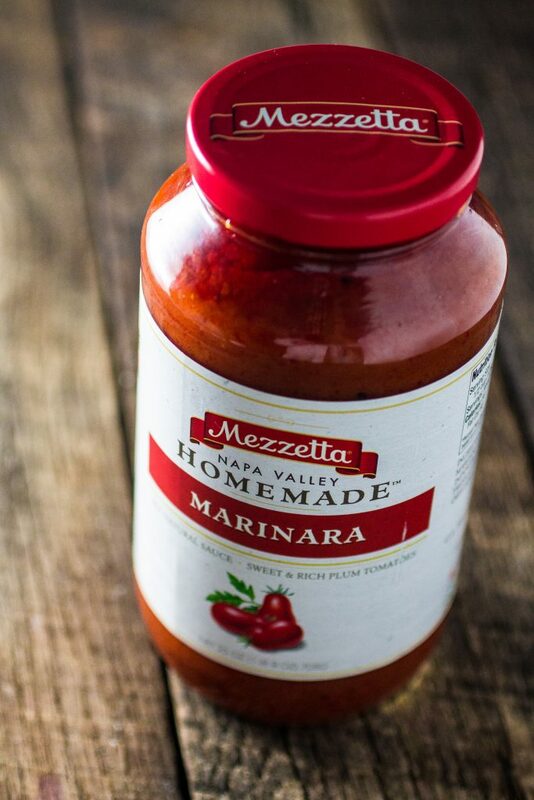 Mezzetta Napa Valley Homemade Marinara sauce is nothing like the other prepared store-bought sauces in the market. It tastes like a sauce you would made from scratch with real tomatoes. I was so impressed I had to check the ingredients on the label and, bingo, I was right! Real food. 100% hand-selected plum tomatoes. No added sugar or paste. Ready to be poured over your favorite kind of pasta, or used in an infinite number of delicious recipes, like this Chicken Cacciatore! I mean, it is no surprise Mezzetta‘s marinara sauce is this good. All their products are outstanding and I’m always proud to work with them, since it’s a brand that is family owned and committed to bringing us the highest quality products, without shortcuts. I’ve only tasted the Marinara, but can’t wait to get my hands on their other flavors: Tomato & Sweet Basil, Spicy Marinara, Roasted Garlic & Caramelized Onions, Parmesan, Asiago & Romano and Wild Mushroom. Seriously, one sounds better than the other and I can think of about a million recipes where I would like to use these sauces. But back to the Chicken Cacciatore! And even though this recipe was calculated to feed a crowd, I strongly suggest you double it if you want to feed more than 4 people. It vanished in seconds in our home, leaving just enough for leftovers the next day, which were really appreciated. Season the chicken thighs with salt and pepper and dredge them into the flour to coat. In a large saute pan, or cast iron skillet, heat the olive oil over medium high heat and, once hot, cook the chicken thighs until browned (about 3 minutes per side). Remove the chicken from the pan and reserve. Add more olive oil to the pan, if necessary, and sauté the onion and garlic until translucent (about 2 minutes). Add the peppers and continue sautéing until tender (about 2 more minutes). Season with salt and pepper. Add the white wine and cook, scrapping all the browned bits from the bottom, until almost all gone. Add the marinara sauce, chicken broth, oregano and stir to combine. Add back the chicken and once the sauce is boiling again, bring it to a simmer (medium-low heat), cover and cook for 30 minutes or until the chicken is cooked through and tender. Transfer the chicken to a serving dish and spoon the sauce over it, then sprinkle the chopped basil and serve. there homemade sauces are really delicious! love this recipe Olivia! As I don’t eat red meat, every chicken recipe is very welcome! Thank you for this new one! And all the sauces look delicious! Wow this looks tasty. 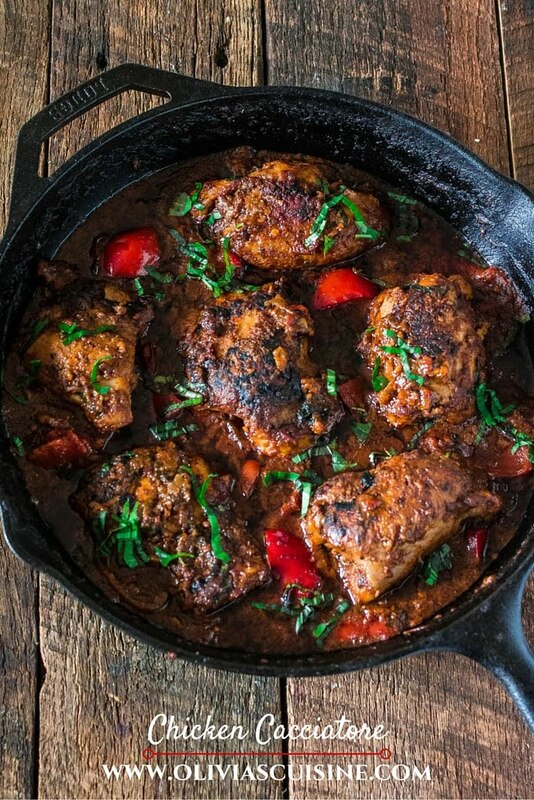 I can honestly admit that I’ve never tried chicken cacciatore but after reading the ingredients I would so love this without a doubt! Might have turned this gal into a fan, can’t wait to give it a try! I’d love for you to come link up with us over at Throwback Thursday link party! That looks like the perfect weeknight meal…mouthwatering good! It caught my eye at #FoodieFriDIY…so glad you shared it! Pinned to try it! My mouth is watering! 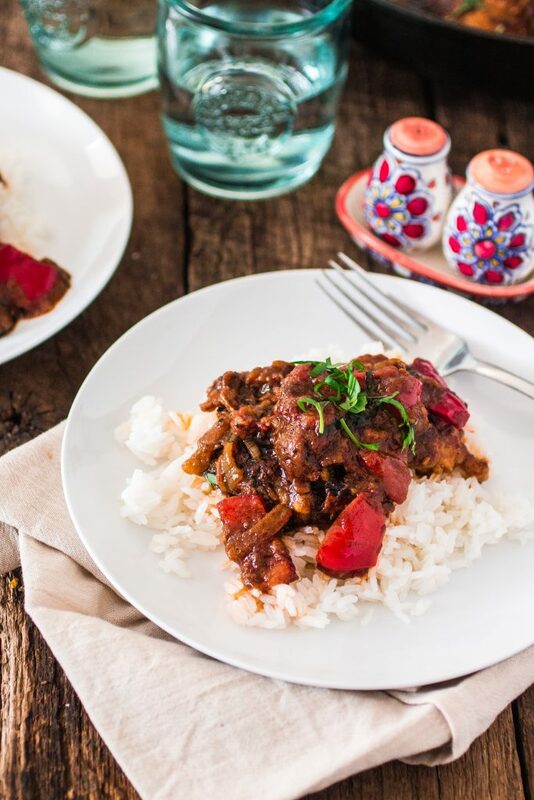 Chicken Cacciatore is one of my favorite dishes! !